Bow in hand, Boston Bruins goalie Tim Thomas was perched in a tree in northern Manitoba as he stared down a bear. In the first period, the Bruins and Ducks went back and forth a bit. Bruins went on the PP thanks to Brookbank, but it didn't lead to anything. Same for the Ducks and Krejci. At about the time that you're realizing that Aaron Ward isn't playing, Matt Hunwick steps up and makes you notice. Krejci pokes it off a duckstick to Ryder, who battles it in from neutral ice to the slot. Then he passes it across for Wheeler, but the no-look spin-o-rama pass goes behind him. Luckily, Hunwick streaks in and BOOM. Tick Tock Goal. 1-0. Let's keep that kid around a bit longer, eh? The last 2 minutes of the first, same as most of the first. Ducks outshoot the Bruins pretty handily. 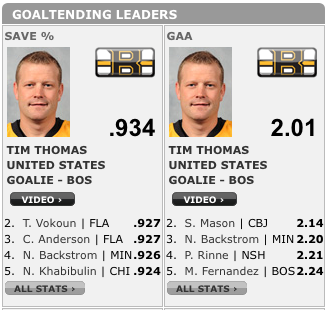 Tim Thomas has all the answers, like that kid you cheated off of in 7th grade. The second period begins. The ducks have it in the Bruins zone. So the backcheck. Stuart and Krejci take the puck away. Then some magic passing happens. Krejci-Hnidy-past Krejci-Wheeler-Krejci-Ryder-Bar-Net. DINK! Goal. 2-0. In a post-game interview, Blake Wheeler says that Ryder has an "Unbelievable shot." No lie, Wheels. Kobasew picks it up in the Bruins zone. He skates it up. Sure, other guys skate around with him and make the defenders play the pass. But Kobasew skates the rink and puts it in. 3-0. The Number 12 has often been a good player for the Bruins - Oates, Rolston, Cashman, Byers, Lukowich, and now Kobasew. I don't expect to see it hanging from the rafters anytime soon, but it's still interesting. There was a guy there last night with a Rolston jersey, and he had taken a big piece of masking tape and written Kobasew on it and stuck it over Rolston. Good looks, dude, wherever you are. J.S. Giguere will have to get Giggy with it on the Bench for the rest of the night. Enter Jonas Hiller. The "Hillll-eeeerrrrr" chants start up right away. Sick save by thomas. Gotta put it in. The next 2 big events are fights. Surprise, surprise. The Ducks get in fights. First, Parros lays a big hit on Savard and he limps to the Bench. So Shawn Thornton steps in. Here's HockeyFights page. Good effort by 6'2", 217 lb Thornton. Bwahahahahaha nice goonery there, Anaheim. Somewhere in there, Savard and Scott neidermayer throw down, but they each get 2 minutes roughing and Savard doesn't come back to the game. Neither does Lucic. Which means somebody other than the top line has to step up. Luckily, we have this scoring depth...and at 2 minutes to go in the second, the Ducks clear to Thomas. Thomas makes a DIRTY breakout pass that's actually illegal in 17 countries and Utah, finds Ryder on the far blue line. Ryder puts it in with Authority. Edwards calls it a goal off Kessel's leg. Kessel gets the screen, Ryder gets the goal. 4-0. Tim Thomas Hunts Bears with the assist. As they said in the all-star game, SICK MOVES. p.s. PPG! You figure with 2 minutes to go in the second, and up 4-0, the rest is just going to be a whole lot of not-that-much. But you forget that they're playing Anaheim, the second-most-penalized team in the league (third man in? Are you SERIOUS?) and they have guys whose hockey resume is basically fists and mustaches. George Parros really stepped up for the Bruins here, and takes a holding call with less than a minute to go. He tries for the unsportsmanlike, but....they don't give it to him. It's ok, we'll take the single minor. And by "we," I mean Kobasew. And by "take the single minor," I mean Krejci-Ference-Wideman-Kobasew-NET. 5-0. The second period is the Chuck and Mike show, we'll be taking your calls in just a minute. Hold on, though, folks, we've just got to score 2 goals each. Hat trick watch for both as we go into the third. The third is a much calmer game. The ducks are not calm, but they stopped taking penalties after Pronger cries to the refs about how the Ducks keep getting penalties. There's a solution, there, elbow-machine: Stop commiting penalties. One way or another, the only penalty in the third is Mark Stuart. Whatever. With 6:30 left, Bitz picks up a pass in the neutral zone. He's got future hall-of-famer Scott Neidermayer on him. But Bitz is a big guy. He muscles his way through Neidermayer (!!!) and then roofs it over Hiller. There's that third goal in the third for him, it's a shame it's 2 days late. You almost think about tossing your hat on the ice, but you're way up in the balcony and it didn't work last time. I hope Savard and Lucic are ok, or Kessel's going to need some new linemates against Washington. Damn. The longest winning streak in the east right now is Toronto, with 3. As Double A Hockey points out, Shane Hnidy (and Phil Kessel) are the only ones without points in the last 2 games, goalies included. Any update on Savvy and Lucic?